Garlic has been an important part of human diets for thousands of years, enjoyed equally for the robust flavor when cooking with garlic as well as for its many health benefits and healing powers. Cooking with garlic can be as simple as roasting it in the oven wrapped in foil to more complex garlic recipes that play on its changing flavor depending on how finely it is chopped and minced and how long it is sauteed and cooked. Some people are intimidated when they first start cooking with garlic, worried that they’ll add too much or that they may cook it too long — or add too little and not cook it enough. This quick guide is designed to dispel those fears and get you started on the right foot into your culinary adventures with garlic! The type of garlic you’re working with will have a huge impact on flavor, as well how mature the garlic cultivar is and how long it has been stored. 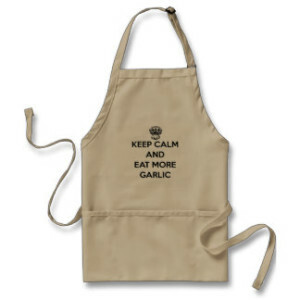 Each variety of garlic will bring its own subtle taste and flavor to the recipe you’re using. 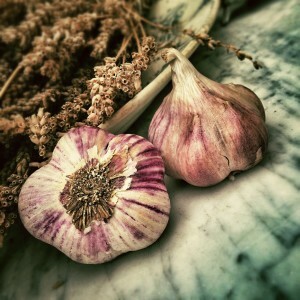 Garlic varieties such as Purple Stripe are favorites for dishes that involve baking garlic while a Rocambole might be preferred when raw garlic is called for in a salad or sauce. Don’t be intimidated, though, or paralyzed by all the options. Garlic is almost always delicious and many of the differences are subtle so it’s hard to go wrong. Try to look at cooking with garlic as a delicious science experiment where there are no wrong answers. Eating garlic has some amazing health benefits but not all garlic meals are created equal. Garlic’s healing powers all start with the production of allicin, which only happens when garlic is chopped, minced, or crushed. Roasted garlic tastes amazing and is simple to make — especially if you own a cast iron garlic roaster — but its health benefits are minimal as no allicin is produced since the head of garlic and cloves are cooked whole without chopping. The same is true of cooking with garlic as far as recipes that call for cloves to be baked whole; if there’s no chopping, there’s no allicin and no health boost. Care must be taken even when garlic is chopped, as it takes about 15 minutes for allicin production to peak and it can be destroyed by too much heat. Mincing or crushing garlic can produce slightly different results as far as flavor. More details can be found in our eating raw garlic guide and remember, this is only for those concerned about maximizing health benefits. 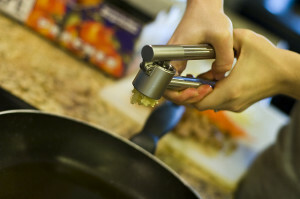 There is a difference between mincing or crushing (typically with a garlic press) when cooking with garlic. It’s pretty subtle, however, so in general you should stick with the technique that you’re most comfortable with. Most professional chefs prefer mincing as it gives finer control over consistency, taste, and how long it will need to be cooked but there’s really no right or wrong answer here. Mincing has more of a learning curve but requires far less clean-up in the end. 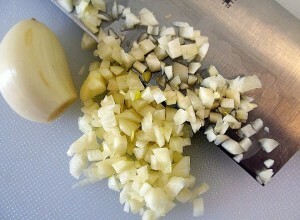 If you do decide to mince, invest in a good chef’s knife and consider a dedicated cutting board just for your garlic.